I recently made a crispy baked Escolar filet with coconut. I really liked this bright, sweet, and oh-so-summery punch of flavor. As I had a bit of coconut leftover, I began to think of other foods that incorporate similar flavors that I love. 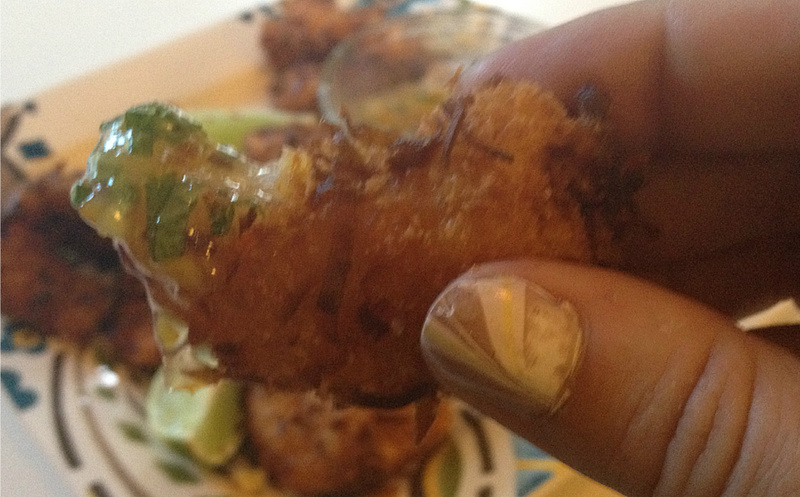 Years ago something I became addicted to (shamefully) was Outback’s Coconut shrimp. I’ve noticed a number of restaurants have picked up a similar recipe, but the last few times I’ve tried this dish, it’s been disappointing. The coating was too much or soggy, and the shrimp were small and sometimes not even cleaned. The great thing about perfecting a recipe at home is that you control what does and does not go into it; the bad thing is once you have it down pat you find it’s harder and harder to eat out. …Maybe that’s a good thing. The interesting part of the coconut shrimp was creating the spicy citrus marmalade that compliments the sweet coconut perfectly, and it was super easy. I fried my shrimp, thinking of this offering as an appetizer and not an entree. Frying the shrimp of course insures crispiness, but it also keeps the shrimp from shrinking as they so often do during cooking. You can bake the shrimp instead – it honestly comes out JUST as good – and directions for doing so are below. Take the time to clean your shrimp. It’s really not that bad and you can pretend you’re a rugged chef who hunted the wilds for the bottom feeders you’re about to devour. I tend to butterfly the shrimp about 1/2 to 2/3’s of the way up the back of the shrimp because it helps it cook evenly, makes them seem larger for a more effective appetizer, and they have more surface area for the awesome dip. You don’t have to do that, but be sure to “devein” the shrimp in the very least. Surprise: It’s not a vein. It’s the poop shoot. So devein away. Frying directions: Fill a heavy, deep pan or stock pot with about 3 inches of oil and heat to roughly 375 degrees. The shrimp are going to cook quick and you want them to brown, but not burn. Combine the panko and coconut shreds in a bowl. 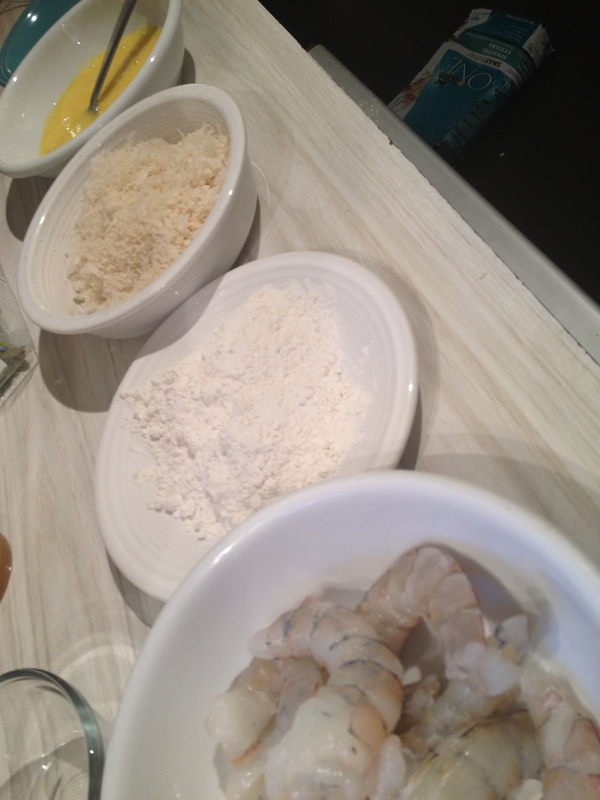 While the oil is heating up, dredge your cleaned shrimp – lightly coat in flour, shaking off excess, followed by a dip in the beaten eggs, ending with a coat in the panko & coconut mixture. Fry in the oil for about 3-4 minutes per shrimp. They should start to get golden pretty quickly, and they will continue cooking a bit after you take them out of the oil, so if it’s been 3 minutes and they’re brown, pull them out and move to a paper towel coated plate to drain. While the fried shrimp are resting, make your dipping sauce: Combine all ingredients in a bowl, adjusting the heat with more or less red pepper flakes or wasabi to fit your own preference. Remember that as it sits it will get a little spicier if you’re using red pepper flakes. If you’d rather bake the shrimp, preheat your oven to 400. Spray a baking sheet with olive oil spray (Pam works), prepare the shrimp the same as if you were going to fry them, and layout the shrimp on a single layer on the pan. Spray the tops of the shrimp with a bit of the olive oil spray. Cook for 10-12 minutes, flipping half way through. Seriously, I was surprised that these came out just as tasty as their fried counter parts, there was less mess and less calories. The only difference was there was slightly less browning as well. Serve with slices of lime and make sure you put a few shrimp to the side for yourself because these will disappear entirely too fast. Ridiculously too fast. I recommend a pound of shrimp as an appetizer for four people who like shrimp. People seem to have a tendency to eat far more than they expect of these, like really good pizza. You may have to double the marmalade as well depending on heavy handed dippers. So freakin’ good. 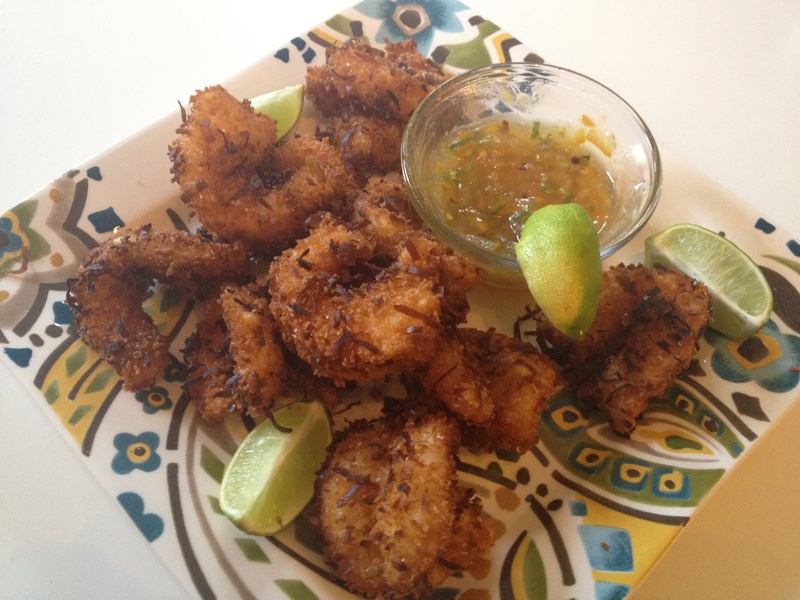 This entry was posted in Entertainment, Geek Chef, Recipes and tagged appetizer, coconut shrimp, crispy, diet, dinner party, dip, easy, eat, food, foodie, fun, outback, picnic, recipe, recipes, shell fish, shrimp, shrimp cocktai, spicy marmalade, summer, takeaway.